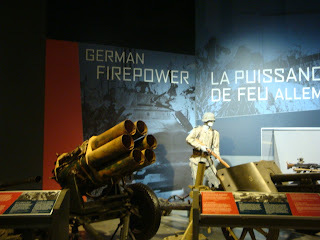 We were in Ottawa only a few days but two sites stood out for us: the Cenotaph--Canada's National War Memorial--and the Canadian War Museum. We visited the Cenotaph on our first day, while walking about the city. 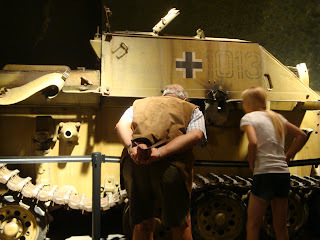 We spent our second day at the War Museum. 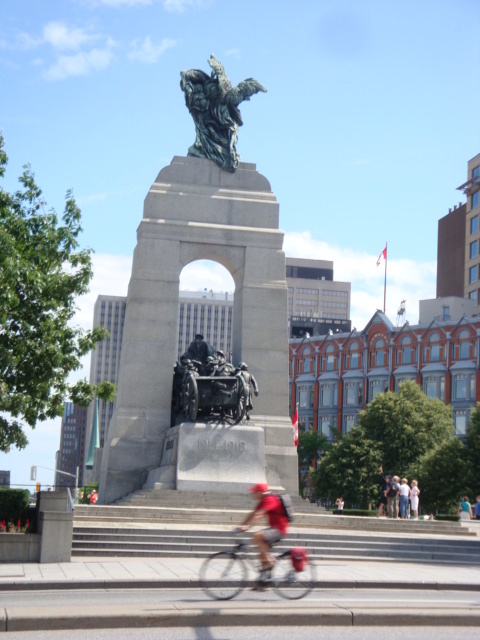 The Cenotaph, above, is located in the very heart of Ottawa, in Confederation Square, at the corner of Elgin and Wellington Streets. 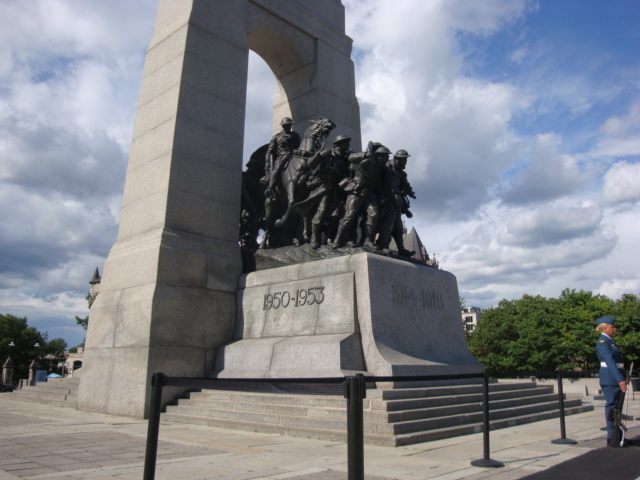 The Memorial was originally built to commemorate World War I. It was re-dedicated in 1982 to include World War II; in 2000, to include the Korean War. All those who gave their lives during those wars are commemorated here. Two sentries stand on guard daily in summer. The body of the Unknown Soldier is buried at the base of the Memorial. He died near Vimy Ridge in France in 1917, the site of one of Canada's most famous battles and its greatest victory during WWI, perhaps its greatest victory of any war. He was laid to rest at that time at Vimy, which is located just north of the city of Arras in Northeastern France. 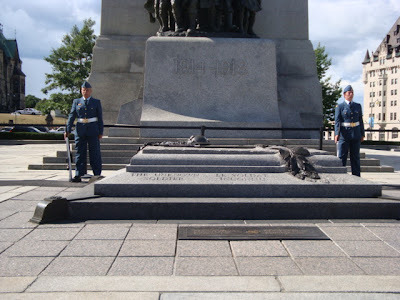 His remains were later exhumed from Vimy and re-buried at the base of the Memorial in Ottawa, with Governor-General Adrienne Clarkson, veterans and a large crowd attending on May 28, 2000. The Tomb of the Unknown Soldier symbolizes the sacrifice made by every Canadian who has died or may yet die for his or her country. The headstone of the Unknown Soldier can be found in the Canadian War Museum at the Memorial Hall. Below, the two guards with the granite sarcophagus which encloses a coffin containing the remains of the Unknown Soldier. The Battle at Vimy Ridge began in the early morning hours of 9 April 1917. 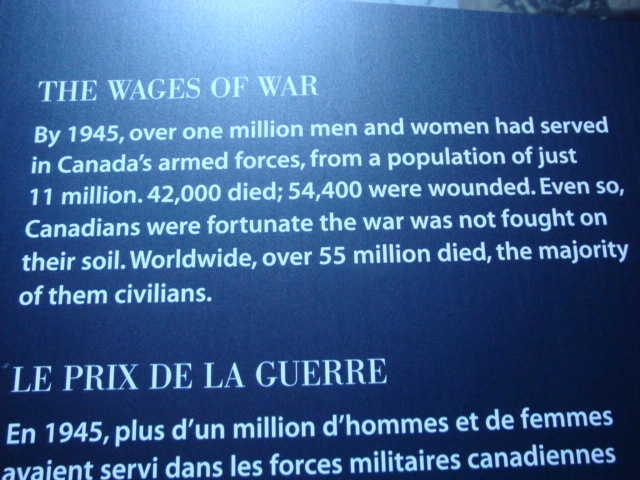 At the end, three days later, more than 10,000 Canadians of the 35,000 who fought there had died or been wounded. Ordinary men from all parts of Canada had united to become the Canadian Corps. 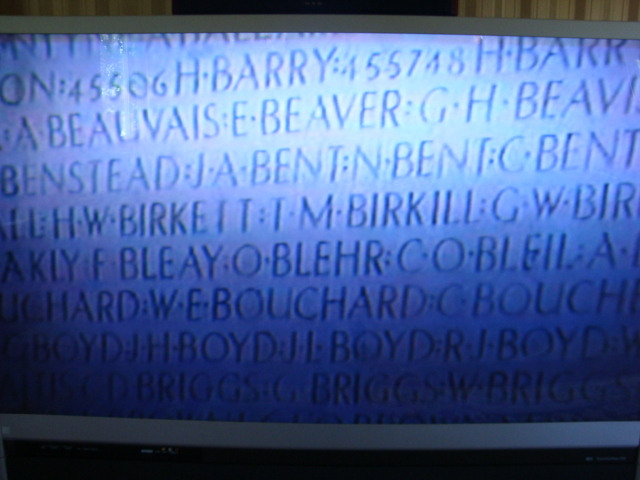 The names of all those killed in France during WWI--but unidentified--are engraved on the Memorial at Vimy, a total of 11,285 names. 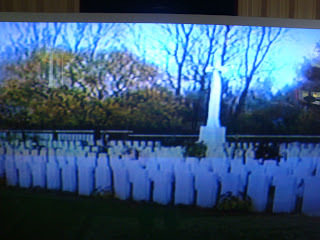 Those who were identified are buried in the cemeteries in the area, each with a headstone. More than 7,000 are buried in 30 war cemeteries within a 20-kilometer range of the Vimy Memorial. 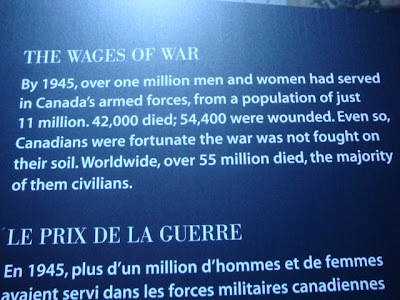 About 66,000 Canadian service personnel died in the First World War from a Canadian population of about 8 million. 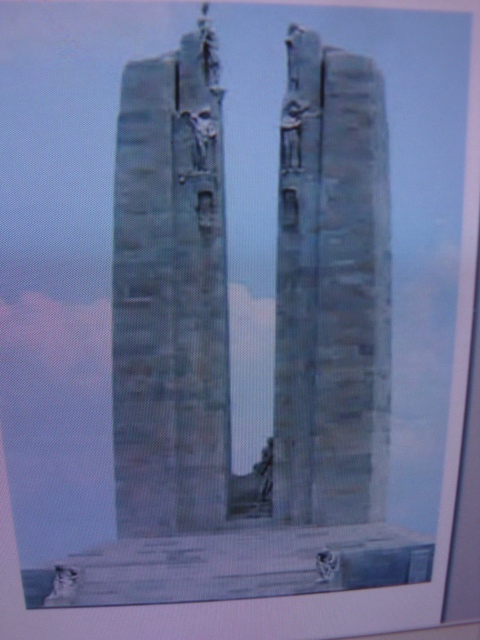 The two pictures below show some of the names engraved on the monument and a Canadian cemetery in the area. All the cemeteries in the region--German, French, British, Canadian--are beautifully maintained. 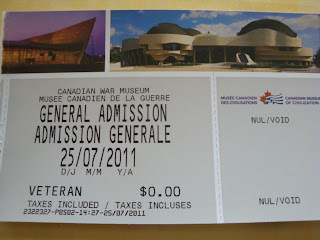 The first time I visited Vimy was in 1962. My husband and I, our two children and my mother-in-law, Kate, headed to the coastline of western France to visit Dieppe and parts of Normandy. Vimy was an important stop enroute for us. It was early evening on a Saturday when we pulled into a large parking area at the main square in Arras. We knew it would be too late to visit the Memorial and the cemetery, but we needed to find a campsite for the night. We wanted one near Vimy but we weren't sure about which way to go. As we looked at our map, there was a knock on the car window. Looking up, we saw a gentleman in his late 40s smiling in. He asked us if we needed any help, speaking very good English. He knew from our license plate that we were Canadians, he told us. We explained our dilemma. 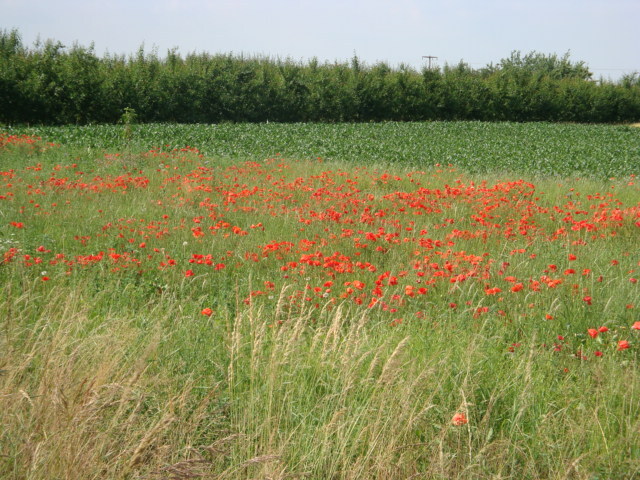 He immediately offered to lead us to a campsite near Vimy, which was several kilometers north of Arras. So off we went. He insisted when we got there that we go to a cafe with him and his wife first. There he ordered drinks for all and proceeded to thank us--Canadians--for all the help we had given France in two World Wars. He told us that he and his wife--and France--would never forget Canada, as in both World Wars Canada was there from the beginning. Giving us his card, he also told us that if we ever needed any help to call him. We were just a few hours from our home in southern Belgium, making that a wonderful introduction to our trip to visit the war cemeteries in northwestern France. Vimy Ridge is sacred ground to Canada. It is situated in a 100-hectare park given by the people of France to Canada as a tribute to the Canadian soldiers who fought and died there beside their French allies. The ﻿National War Memorial in Ottawa reminded me of that trip to Vimy. The Cenotaph was begun in 1926 by Vernon March of Farnborough, England. His theme was to represent Canada's response to war, symbolized by service people from all disciplines marching through a triumphal arch, but with the aim to avoid the glorification of war. March's six brothers and a sister completed the memorial in July 1932 after his death (1930). It was displayed in Hyde Park, London and stored in the foundry before being relocated to Ottawa in 1937. 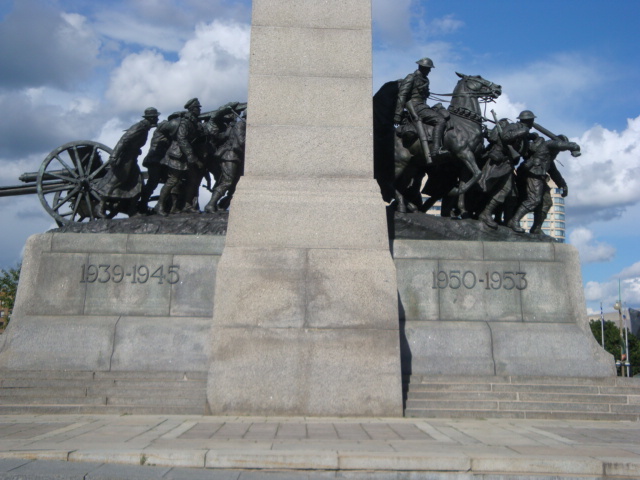 The entire Cenotaph, including the building of the arch, was completed on 19 October 1938. The Memorial was officially unveiled on 21 May 1939 by King George VI with approximately 100,000 people present at the site. 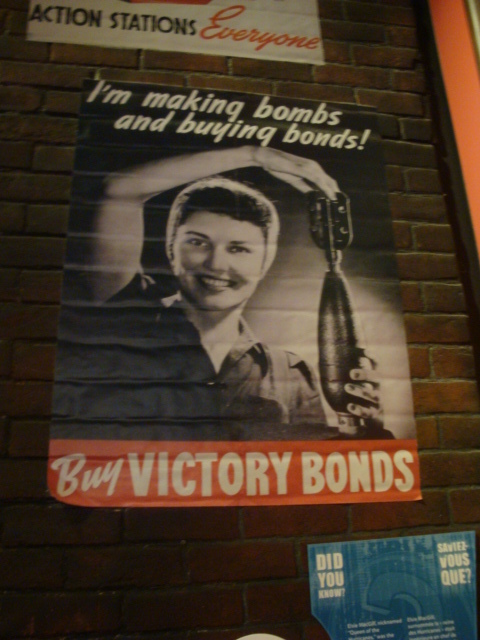 This was just a few months prior to the beginning of World War II. This event and the tour arranged with it marked the first time Canada's reigning monarch had visited the country. 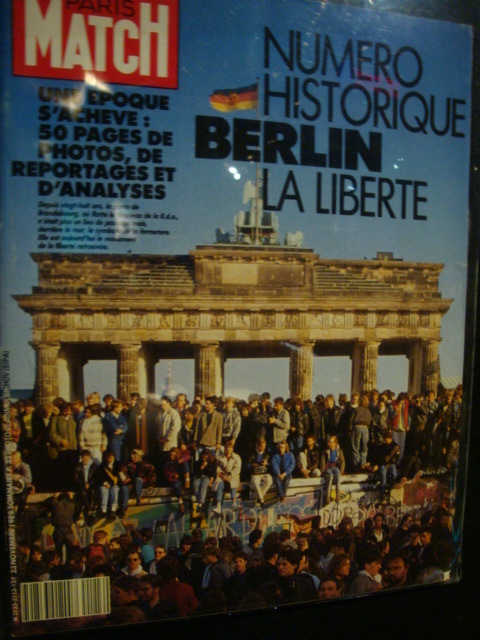 I remember that visit, though perhaps more from the stories I heard. King George and Queen Elizabeth--our present Queen's parents--visited Charlottetown, Prince Edward Isand on that tour. My father took me to see them--holding me high--as they drove past in an open carriage. He told me the Queen looked right at me and smiled, perhaps because I reminded her of her own two daughters back home in London, England. The Cenotaph is an imposing structure. It stands very high and can be seen from some distance. It is sobering to look upon it and to realize how much sacrifice was made by our men and women in war. Before we left for Ottawa, Heiko had asked us what we would like to see. At the top of the list was the War Museum. As Heiko and Heather had not yet been there, it would be interesting for all of us. The five of us, including our young granddaughter Natasha, spent most of an afternoon visiting it. The museum is outstanding and well worth a visit. It showcases our many wars and peacekeeping operations. Both Hans and Heiko had served outside Canada in peacekeeping missions. Hans had spent six months with the Army Medical Corps in both Egypt and Cyprus, the latter during the crisis between the Greeks and Cypriots. Heiko served with the Canadian Air Force in Honduras and Egypt as a helicopter pilot and in Afghanistan flying Hercules aircraft into that country. As we all had a long military association (my late husband had also served in the RCAF for 28 years), it was especially interesting and brought back many memories. As I type the letters "RCAF" that designation is now official once again. Our present-day men and women in the Canadian military now belong to the Royal Canadian Air Force (RCAF), the Royal Canadian Navy (RCN) and the Canadian Army. 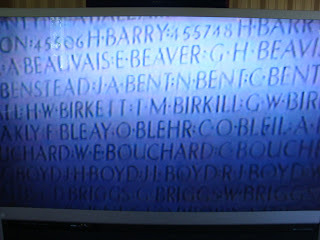 Those men and women commemorated on the Cenotaph fought, flew and went to sea under those same designations and names. We were pleasantly surprised to find that the museum was free for all serving members, veterans and their families. That included free parking and a chit towards a snack in the facility's pub. A military or retired military identification card must be shown. For others, the cost was $18. 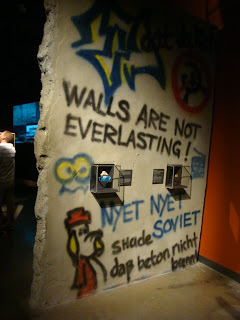 It is still well worth a visit. 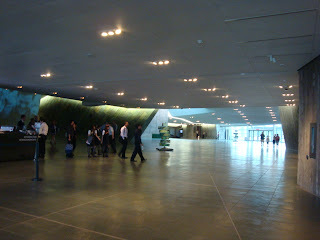 The museum takes considerable time to go through and one afternoon is not long enough. 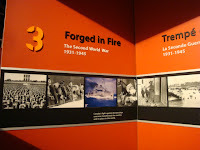 Several visits are needed to do it justice and to take in all the various exhibits, written accounts and videos that showcase and explain the history and the stories. One visit leaves indelible memories and a wish to return. 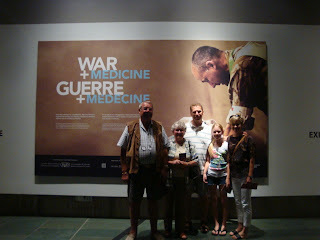 The five of us in front of the War and Medicine depiction. This area was fascinating and well done. 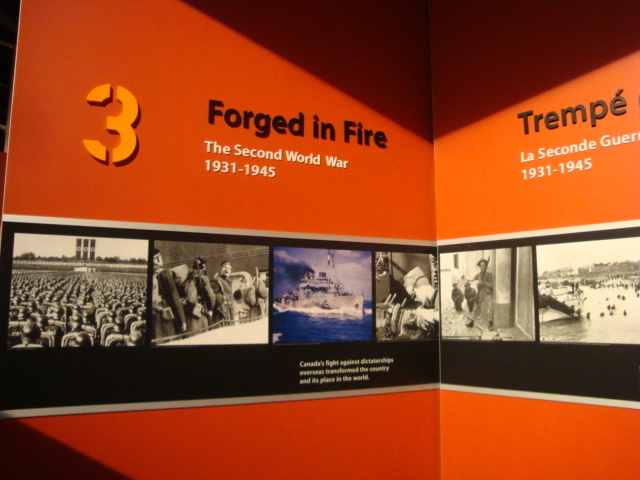 The entire museum is divided into areas relating to war and peace. Both the Cenotaph and the War Museum make one proud of those who came before us, those who died for their country and ours in other lands. Canada went to those wars because of our ties with Great Britain and the British Empire. From those wars, we became a country in our own right. We are only 35 million people strong but we have made a name for outselves worldwide. 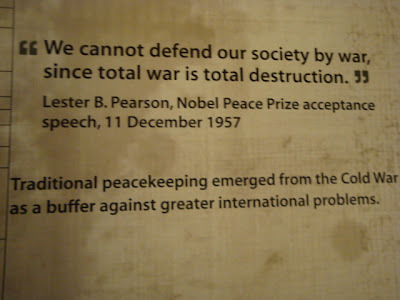 I fervently hope Canada reverts to its role as a Peace Keeper and not as a Warrior.